I can actually remember how the last issue of The Unexpected ended. Firebrand died! Her soul absorbed by the monstrous cartoon supervillain Onimar Synn, our plucky conflict engine-hearted pugilist's fate appears to be sealed. "But, there are still two issues of the series to come out, Daw!" I hear you cry. Yes, well, you've got me there, haven't you? Mind you, this series did kill off three major characters in its first issue. You never know… Anyway, for a series given to bouts of manic hyperbole, the cover is startlingly prosaic in reminding us of what's at stake: Synn must die so Firebrand can live. Right you are. Let's find out whether this issue Synn does indeed kick the proverbial bucket and starts pushing up whatever passes for daisies in his section of the galaxy, then, shall we? Neon and Firebrand start the issue deep inside Onimar Synn's body. While I'll duly concede that that is not a sentence I ever envisaged writing, I remain somewhat in awe of Steve Orlando's chutzpah here. There's a touch of metaphysical philosophy to the sequence in which Neon follows (how?) Firebrand's soul (what?) into Onimar Synn's "bones" (what?) and Cliquet's art does a really rather good job of representing the experience as something like a spiritual water chute at one of those swimming-themed fun parks that small children find so unfathomably enjoyable. Not for the first time this series, it is fair to make the observation that the ideas are Morrison-esque but the language is all Orlando. A chase turned tug-of-war over the spirit of a fallen comrade inside the physical body of a monomaniacal supervillain is worthy of Kirby at his best, but describing the opposing force as merely a "node" is not really doing the concept justice. That Neon, who is, let's remember, meant to be our exposition guy, doesn't really understand exactly how this is all happening is a bit disappointing too. As should be expected by now, what follows is largely nonsense. The node is comprised of Nth metal, a 'prison' that Synn would have used to capture Firebrand's soul. How Neon is able to summon the sheer (mental? Spiritual?) strength to pluck a mostly consumed Firebrand (only her ghostly grey hand is protruding from the 'node' at this point) when he later says he can't use any magical power because there's so much Nth metal everywhere is never properly (well, at all, actually) explained. Nor is the reason for the Nth metal isotope, which has been pea-sized and shaped all series, suddenly looking larger and diamond-shaped and, well, very similar to the 'node' Firebrand has just escaped. Don't misunderstand me. There's some moderately impressive stuff here. 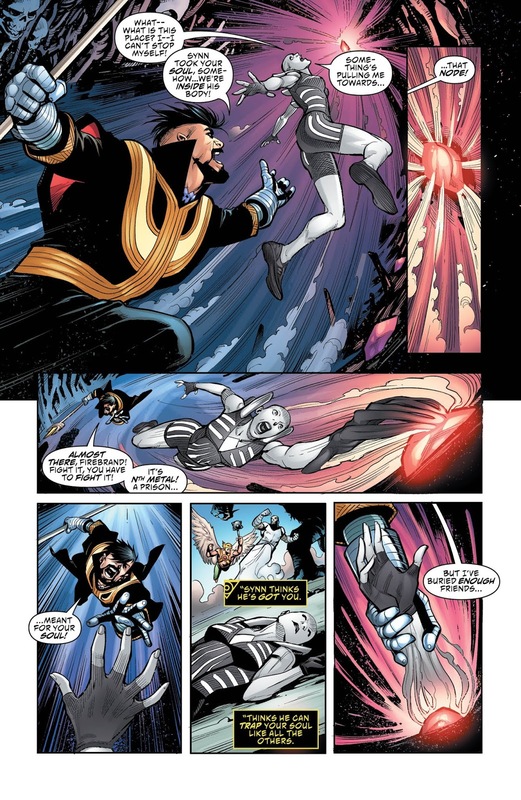 When Firebrand and Neon encounter the recently deceased Phayde in Synn's bones and she describes them as "his most holy church", there's something potentially quite significant being said about how Synn's followers view him and how, for that matter, Synn views himself, but why Phayde should still be sentient at this point is never properly explained and the fact that both she and all of Synn's other victims seem to maintain a kind of independent consciousness within him does rather undermine the whole notion of 'consuming' souls on which the character is predicated. While Firebrand and Neon plot a metaphysical prison break, Hawkman is doing a rather impressive job of fighting Synn physically. I'll confess I was worried about Orlando taking on a character who is already being portrayed rather convincingly elsewhere, but he uses him well here – particularly in his defeat of Synn's undead dinosaur-dragon hybrid. 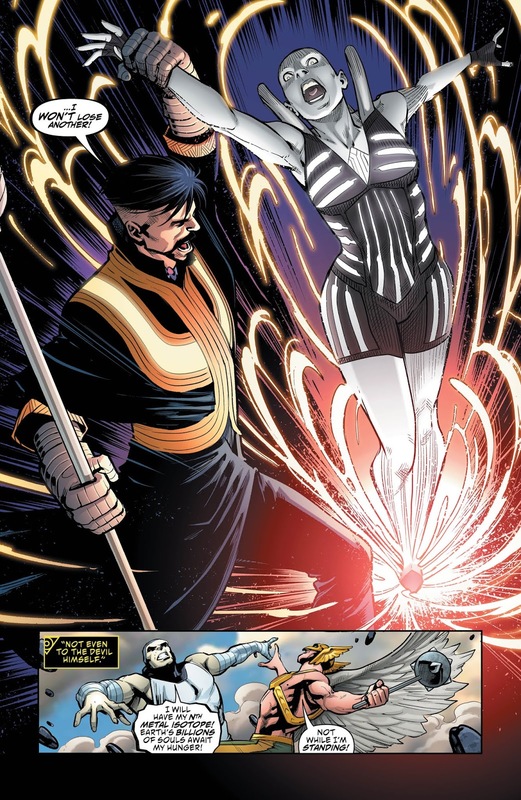 When Firebrand and Neon do eventually break out of Synn's body (and, yes, that is as messy as it sounds), the story returns to the subject of the Nth metal isotope which immediately exposes its flaws and limitations. Having released the captured souls of Synn's many victims, our heroes have their work cut out trying to deal with the now critical Nth metal isotope. Synn's victims are not, after all, embodiments of calm and serenity. They're pissed off and their anger is about to make the isotope go "boom" despite Hawkman's attempts to 'ground' its energy with his mace. This is the same mace which, when it came into close proximity to the Nth metal isotope last issue, turned Hawkman into an angry, aggressive lunatic, but okay. Neon keeps on moaning on about how he can't transform the isotope itself, but Firebrand reminds him that he can transform its energy just like he did in Gotham. Okay. 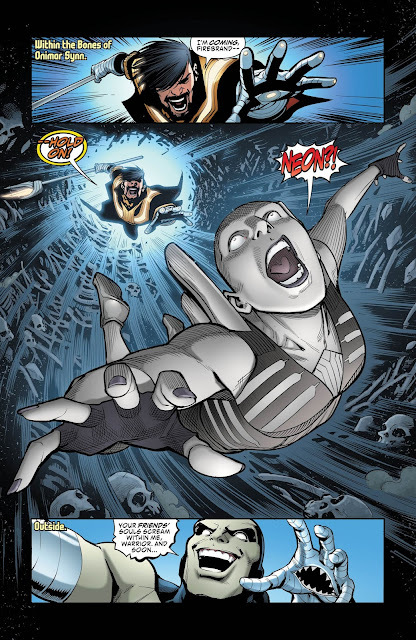 In the meantime, the reality is 'rupturing' which sounds horribly catastrophic but just means that our heroes get to not die but instead travel to somewhere "outside the multiverse" where they encounter a nice sight gag, meet a Tempus Fuginaut and then, eventually, the big bad of the entire series Mandrakk himself. In the meantime, the Bad Samaritan reincorporates himself in north-west Canada in a sequence that would have actually been quite cool were it not for the fact that, back in issue 1, the Bad Samaritan actually died in Mammoth City (which is in New Jersey). Ho-hum. If you've been reading this series for any length of time, you'll know pretty much what to expect here: a skeleton of a plot that is more or less serviceable (heroes escape villain A, explode item B in the process, travel to place C and encounter villain D at the end); a smattering of intriguing dialogue sprinkled on a much larger mass of either impenetrable or hyperbolic verbiage; obscure references to the wider DC universe; reasonably impressive action; the odd glaring mistake; and lots and lots of nonsense. The thing is, despite its flaws, there's actually fun to be had, too, albeit of a peculiarly exasperating kind. The fight with Synn is enjoyable enough, for example, and, while the Morrison-esque flourishes once the team reaches the Monitors won't be to everyone's taste, I kind of liked them. More The Unexpected means more silliness, more Morrison homage, and more ludicrous action. Ronan Cliquet's art works well for this book, which requires a certain clarity and dynamism; Cliquet thankfully provides both. Orlando's storytelling continues to be characterised by an over-reliance on technobabble and characters shouting plot points at one another to drive things forward. That said, there are odd moments of mystery, interaction, and action which mean the issue is not a complete waste of time.